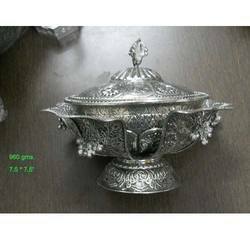 We are a leading Manufacturer of silver plated oval fruit bowl, white metal fruit bowl and designer silver plated fruit bowl from Jaipur, India. 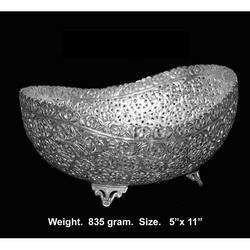 We are the most prominent manufacturer of Silver Plated Oval Fruit Bowl, which is used to serve fruit and snacks. 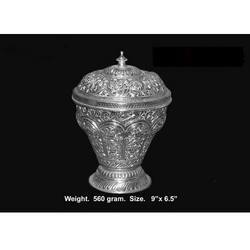 Available in the excellent silver finish and various dimensions, this fruit bowl is offered in customizable specifications at nominal prices. Finding usage in various dining purposes in residential areas, hotels and restaurants, we ensure that our customers get only the durable and quality attested products. With the aid of sound infrastructure, we are presenting a vivid range of beautifully crafted White Metal Fruit Bowl. Our range is fabricated from the top grade raw material and sophisticated technology in varied innovative designs, sizes and shapes. These Decorative Bowls are widely used in varied sectors like residential, hotels and restaurants for serving varied snacks and fruit items.